The black boxes contain information about every little thing that happens to the aircraft while it is in the air, which is also called a Flight Data Recording. With the box, you can find out what the plane’s pilots were communicating and conversing about throughout the flight. 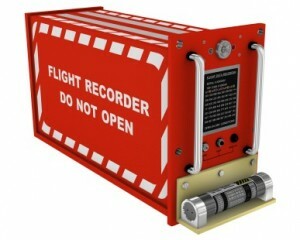 In aircraft language, this is callled a Cockpit Voice Recorder. It is a safety element that will help to ensure air traffic. If something under the course of the trip goes wrong with the plane, this information will be stored in the box’s memory. This way you can make sure that similar cases won’t occur, while in the air. Therefore, the black box us just as much a means of development of all types of aircraft technology. Although the box is labeled with the color black. It’s more red or orange because it is easier to find the box then, should there be a plane crash. For the black box, not to be lost in a plane crash you place it in the tail rudder on the plane. A plane will typically crash nose first, because it’s heavier than the tail. The box must withstand a force of 3400 G. In comparison, a person weighing 70 kg, being subjected to a g-force of 6 G experience a weight of 650 kg. So it is a huge pressure the box must be able to withstand. Likewise, it must handle a temperature of 1100 degrees Celsius for over half an hour. It must withstand water depths of over 6000 meters, if the plane crashes into the sea. After the plane crash it can be very difficult to find the black box. Therefore, it is equipped with a ping to be found easier. In the event of a plane crash they will almost always find the box, regardless of what the plane and its passengers have experienced. The black box is so well made with high material quality and tech that you don’t need fear it being destroyed. But it has some limitations. It only emits one signal in a certain time frame before the batteries inside go dead. This led to not finding the box when a Malaysian aircraft suddenly disappeared on March 2014. Therefore, no one could unravel what happened with the aircraft during the disaster.